This article is about the deserted village. For the housing estate in Aylesbury, see Quarrendon Estate. For the school, see Aylesbury Vale Academy. Quarrendon is a deserted medieval village and former civil parish on the outskirts of Aylesbury in Buckinghamshire, England. Today its name is also associated with the modern housing estate of Quarrendon beyond the parish boundary in Aylesbury. The parish has now been renamed Berryfields, the name of a housing development within the boundary. The toponym is derived from the Old English Cweorndun meaning "hill where mill stones are obtained". There is evidence to suggest that the village dates back at least as far as the Anglo Saxon era as the village was reputedly the birthplace of daughters of King Penda, St Edburga and St Edith, and their niece St Osyth. Legend has it that St Osyth was beheaded by the Danish occupiers of Britain at Nuns Wood in the Grounds of St Osyth Priory, where a spring of holy water sprang forth and is still in existence today. Queen Elizabeth I was entertained at Quarrendon Manor by Sir Henry Lee of Ditchley for two days in 1592. The village and its manor survived until the 18th century, when Henry Lee, the Lord of the Manor, went bankrupt and lost all his lands. The only remaining building in the old village is the ruined church of St Peter. In 1817 the building was described in the Gentleman's Magazine as "a melancholy object of contemplation". Until the 1930s there were substantial remains. Old pictures show that the church had north and south aisles with octagonal piers and double-chamfered arches. All that now remains (as of 2006) are two low sections of wall and the foot of one of the south aisle buttresses. The moat, fish ponds and groundworks of the manor house also remain. The modern housing estate of Quarrendon in Aylesbury is named after the ancient village. 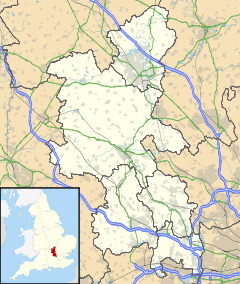 Quarrendon is situated between Aylesbury railway station and Aylesbury Vale Parkway railway station. It is also served by three bus routes. Everson, Paul; Kidd, Sandy (May 2008). "Quarrendon; How the Elizabethans revolutionised garden design". Current Archaeology. 19, No.2 (218): 31–35. Page, W.H., ed. (1927). A History of the County of Buckingham, Volume 4. Victoria County History. pp. 100–102. Pevsner, Nikolaus (1973) . Buckinghamshire. The Buildings of England. Harmondsworth: Penguin Books. p. 229. ISBN 0-14-071019-1. This page was last edited on 4 December 2018, at 16:52 (UTC).